If you do sewing projects from old t-shirts, chances are you have a bag or two (or three? or four?) of knit scraps. 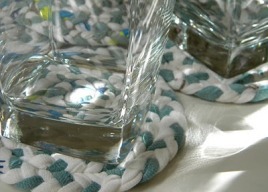 Carolyn from Homework shares a tutorial on her blog showing how to braid strips of knit fabric into fun coasters. Think of them as smaller and updated versions of the classic braided rag rugs that our grandmothers used to make. How cool! Go to the tutorial.